Blue_A10_Envelopes_-_6_x_9_12 is rated 4.6 out of 5 by 5. Rated 5 out of 5 by Janh011and from Perfect blue! These light blue envelope were the perfect touch for our spring wedding. They added a fun pop while keeping it elegant and formal. Rated 4 out of 5 by G8RGRLFL from Nice paper The paper that these envelopes is made from is wonderful. A nice linen texture, very thick. The only minor inconvenience is that the glue on the flap does not stick well. Rated 5 out of 5 by George from Perfect for our Wedding! Received these same day as ordered, in NYC. We used gold calligraphy pens and the ink did not seep through. The paper color was spot on. Rated 4 out of 5 by Nancy T from Couldn't find this color and size anywhere else! I used these for my wedding invites. The envelopes that came with the invites were ok, but I wanted to add a pop of color, since the invites where black. Easier said than done. I looked everywhere for a tiffany blue envelope to fit our 5"x9". this was the only website I found that carried them. The quality is amazing! They even have grain feel to them. The only reason I don't give them all 5 starts, is because the envelopes were a bit darker and richer in person...Also the seal didn't go all the way to the edge, about an inch was left on each side, and it made me iffy that it wasn't secure enough. I just glued the sides down. We make these envelopes. They are JAM Paper envelopes. Thanks for your question! Who doesn't like a big package to open? 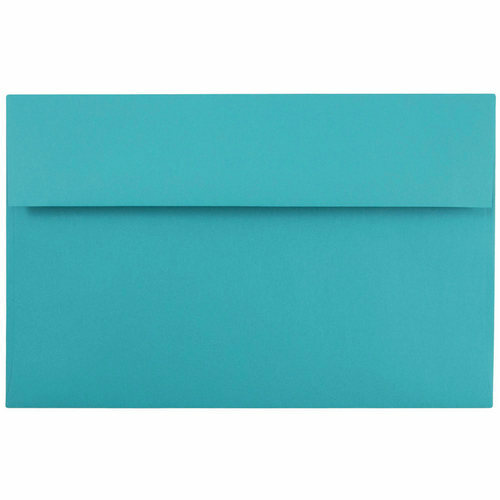 With our Blue A10 Envelopes, your recipients will do just that! A10 Envelopes are such a great solution for anyone looking to send those larger than average files or documents without bending them too many times. With 11 shades of blue to choose from you can be certain to find the right blue for you! Blue A10 Envelopes measure in at 6 x 9 1/2 and feature a rectangular gummed flap.